If you’re looking to get yourself a new laser tag set, then you’ve likely come across different types. In the past, the majority of laser tag guns consisted of two parts – the gun with which you would shoot, and a vest in which you would target. Though in recent years, many companies have decided to start producing laser tag sets with vests and instead opt for moving the receptive sensors and placing them on the guns instead. Whilst this may be more suitable for some people, there are those who will still prefer to use vests for a variety of different reasons. Lets have a look at what the pros are of each option, as well as a recommendation on both different types of laser tag sets. If you’re going to play laser tag at a large arena, the majority of large sets have a vest. They go hand in hand with laser tag guns, and it was a shock to see so many companies producing sets without vests for me personally. Although you might be inclined to opt for a set without a vest, there’s a few reasons that you shouldn’t do this in my opinion. More responsive – As a general rule, sets with vests are far more realistic than sets that use the gun as a target. This is because it’s much easier to create a target within a vest than within the gun itself. With the different aiming points on a vest, this makes it much more fun than just aiming at your opponents gun. Realistic – With sports like airsoft and paintball, the objective is generally to actually shoot your opponent. It’s generally advised to shoot your enemy in the chest or torso, as this is the largest area to aim at. That means that you can’t transfer over your skills into laser tag – in paintball, airsoft or any other form of gun sports your target isn’t going to be your opponents gun. In fact, it’s sort of a weird idea to suggest targeting your opponents gun as opposed to their torso! Feels realistic – Using a laser tag set with bests just feels more realistic as if you’re actually in a battle! If you’re kids are like mine – obsessed with guns – then you really want to try and make things as realistic as possible. These are just a few of the reasons that you may prefer to opt for a laser tag that includes vests. Although they’re not for everyone, there are a few reasons why you might opt for a set that doesn’t include vests. If you do want to opt for a laser tag set that includes vests, then my advice is to go for something like the Armogear Set. Although they run a bit more expensive than sets that don’t have vests, this set is a pretty good quality set. MULTI-PLAYER, MULTI-AMMO  Up to 4 teams can play in this riveting battle! Switch between the unique powers of PISTOL, SHOTGUN, MACHINE GUN, and ROCKET to blast your enemy and declare victory! These laser blasters are ergonomically designed with a solid grip in your hand, easy to handle even for young kids. 100% SAFE, using Child Safety Infrared Signal Emission - 0.9mW. FUN FOR THE WHOLE FAMILY  Tactile vibrations and lifelike shooting sounds make for deeply immersive gameplay, guaranteed to turn kids and adults away from their screens! Have a blast and create cherished memories on holidays, snow days, or birthday parties, with a fun family laser tag tournament! It's the PERFECT GIFT IDEA, sure to delight kids of all ages! What I like most about the Armogear set is that you’re getting good value for money when you consider it’s features. It has 4 different shooting settings, which in my mind make it more suitable for older kids that can really understand how to play laser tag. Would your kids think it’s cool to have shotgun and machine gun modes? I know mine would. Laser tag sets without vests have become increasingly popular recently – it seems that people just aren’t that interested in getting themselves a laser tag set with a vest. There’s likely a few reasons that may explain why these types of laser tag sets are more commonly used by people nowadays. Price – Of course, one of the main reasons that people prefer to opt for a laser tag set without vests is that you save money. Laser tag sets without vests can cost less than half the amount that ones with vests do, so it makes sense to opt for something like this if you’re on a budget. Although it isn’t always the case – you can find some cheaper laser tag sets that include a vest too. Easier to move – If you’ve ever been to a laser tag arena, then the likelihood is that you’re aware of how big and bulky some laser tag sets can be. Although home tag sets aren’t as big and cumbersome as full equipment, it’s much easier for kids to move around if they don’t have a vest weighing them down. Portable – Not only are laser tag guns alone easier to store in your house, but they’re easily portable too. If you have a set with vests, then you might get a little annoy carrying them around all the time. Good for younger kids – If you have younger/smaller children, then it can make sense to get a more simple laser tag set. This is because it just makes sense to opt for a more compact and comfortable set. If they’re really young, the likelihood is that they’re not going to understand how your laser tag set works anyways! A good laser tag set without vests is easy to find – the majority of sets that you’ll find nowadays do not have vest included. My favorite laser tag set without vests is probably the Dynasty Laser Tag Set (I’ve done a full review on Dynasty Laser Tag if you’re interested in finding out more). With FOUR different Team Settings, you can play on the same team or in a 1v1v1v1 Free-For-All Battle. Choose between the Blue Team, Red Team, Green Team, or White Team. Plus, the blaster is the target. Meaning you don't need to wear a vest. They are one of the higher quality laser tag sets on the market – there’s a lot of junk out there. What I liked most about them is their swift customer service. One of the guns I ordered didn’t work properly, and they swiftly sent me out a new one! There’s also no limit on the amount of people that can participate in one game. That means that if you have a set of 4 and so does your cousin, your families can meet up and have a 4 vs 4 game! Overall, there’s a good reason why you may or may not need vests with your laser tag set. Every persons criteria is different, so it can be difficult to find something that will suit everyone. Of course, if you’re jsut starting out playing laser tag then it can be a good idea to just opt for something cheap and easy to use. This way, you’ll know if you’re actually going to use your laser tag set of whether it’s going to end up locked away in the cupboard gathering dust! Hi I’m interested in buying a complete set of laser tag guns and vests. Can you send me which models you are selling with prices. 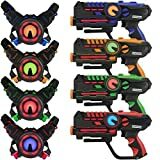 I actually don’t sell laser tag guns here, I’ve just reviewed some of the sets that I have used. You can check out my favorite laser tag set here. Thanks for stopping by!